Check out the student testimony for coach Snipes! August 30, 2017 was the official kick off to a new girls volleyball season for the Seoul Foreign School Crusaders who hope to mount another dominate run through KAIAC (Korean American Interscholastic Activities Conference). But unlike most season opening friendly tune ups, SFS was hosting the Red division’s GSIS (Suwon) Knights. Traditionally this would have been perhaps viewed as another game but this one was different. This one had a different competitive feel then a normal friendly game. Former SFS alumni and coaching legend, JP Rader returns to KAIAC making his GSIS coaching debut after spending several years successfully coaching volleyball at Asbury University in Kentucky. However, on the other bench of the home team was Paul Rader. Paul is also an alumni of SFS and is the son of JP. This marks the first time that these two have squared off against each other as head coaches. Both men have distinguished coaching careers and sports backgrounds and share very strong competitive genes. Competitiveness certainly did not skip a generation. KAIAC has been around since 1972 and it is not uncommon to see alumni athletes come back as coaches. I myself would fall into that category. But it is a rare opportunity to witness a father/son duo and it shows the impact that sports here in Korea has on generations of people. I myself have had the honor of knowing the Rader family for 2 decades and I hope that many more decades of impact will be in store for the Rader family. I will admit that it was a bit strange to get the phone call asking me to officiate the game. But I am glad that I had the chance to be a part of the moment and witnessing what I call Rader Bash 2017! In appropriate fashion, the game was a nail biter as the Knights took the early 1-0 set lead before the SFS girls were able to settle in and get the 3-2 win. I guess this means for the here and now: SON 1 and Father 0. Let the rivalry begin! The Knights showed how they will be a team to reckon with in the Blue division as they gave the bigger and stronger Crusaders all that they could handle. The Crusaders aim to win another Red Division title this season and certainly have the pieces to do it. I am personally excited to see how this volleyball season will go in Korea and I want to thank the Rader family for their love of Korea and their support of CTI over the years and hope to see more of it in the future. Have a great season! CTI is cheering for you! Nate Tinner is not an international school coach (yet). However, he has a great story to share. I will let you read it in his words. Why do they always serve tea with meals? What’s with all the rice? Where’s the fork and spoon? Why do they drive mopeds instead of cars? Shouldn’t these kids be doing something other than a daily basketball camp during their holiday break? My trip to China was a series of unanswered questions. Most of them were bad questions. Slightly racist questions. Questions stemming from an utter ignorance of how society operates outside of the Western Hemisphere. I should have known better than to expect what I was used to in America, and yet it didn’t take long for me to begin pondering the possibility that there is more to functional human society than the “American Way”. 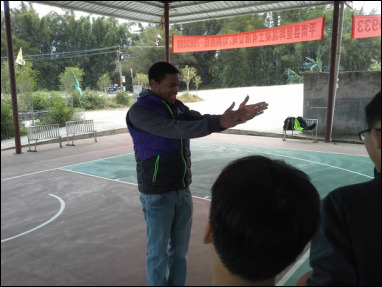 In many ways down on my luck and in other ways just looking for something to do, I traveled to Pingnan, China (Guangxi Province) in late January to teach basketball to a bunch of upstart youngsters just on the brink of CBA stardom. Having never been farther east than Switzerland, imagine my introspection as I headed west in a cozy China Air jetliner headed for Beijing. My geographical categories were exposed at that point for the sociocultural charade that they were, as a kind of belittling notion that attempts to other the “Far East” into Oriental oblivion. Then. I was at the mercy of Chinese hospitality for a month. Having no Mandarin skills beyond “Ni hao” and wondering above all else how I would communicate with people who knew no English, the twin forces of basketball and basic human goodwill became my closest friends. The constant generosity and helpfulness of a number of hosts in Pingnan were refreshing, not because they made communication any easier, but because it shocked me out of my prejudiced fantasy that I had traveled into a different dimension, where “Anglophone” was synonymous with “understanding” and “American” paramount to “kindhearted”—two associations I in fact knew to be false. I quickly learned that there is such a thing as a universal language, made up mostly of grunt-like “uh-huh”s, head movements, hand gestures, and the like. The elementary- and middle-school boys, who faithfully appeared every afternoon to receive basketball wisdom from an amateur twenty-something, managed somehow to understand my pleas and directions well enough to get in lines, form circles, run and dribble at the same time, and miss a gaudy number of left-handed layups. As I watched them struggle with everything I fumbled through at a similar age, I was even graced with the opportunity to learn (and royally mispronounce) several basketball terms in Mandarin. For every airballed finger-roll attempt on their end, there was a missed tone or consonant sound on my end, and through our shared struggles we gained kinship. Struggle, it seems, is the best bond of brotherhood. Bare with my cliché, but China taught me a lot. You learn a lot about who you are when you’re cooped up in hotel room within the borders of a country unlike anything you’ve ever seen before. You think about certain things. You crave and sometimes fight for amenities you apparently can’t live without. You forget about a ton of things that never mattered in the first place. You ponder what to do with your life when you get home. How you’ll change. How you’ll stay the same. I spent most of my trip to China in silence. Weeks on end without speaking a word of English to anyone who could understand it. Weeks. After the initial realization, I feared that I was losing something that I would never get back, or that I would have to re-learn for some time. But in the silence, every smile counted. Each handshake. All the high-fives and camera poses. These were my conversations. And they were rich. Life-giving. Simple. And so I came to appreciate tea. I craved the taste of rice more than anything in the world after about a week. I lost my taste for sugar. I even gained patella tendonitis. But for all the things God gave and took away in Pingnan, I remember one thing the most: they were just like me. As the horn sounded after the clock expired in the fourth quarter of the 2015 APAC (Asia Pacific Activities Conference) championship game in Shanghai, China; the SFS girls emptied the bench on to the court in total excitement, as did the loyal Seoul Foreign School faithful who also made the trip to cheer on their Crusaders (I was amongst them). Coach Jim Milliken, with an all too familiar smile, calmly gathered his ecstatic team (the newly crowned regional APAC champs) and ushered them into a line to shake the hands of their ISB (International School of Beijing) opponents. Naturally, Coach Jim was excited, but he has been in the winner’s circle before over his multiple decades of coaching sports at SFS. He made sure that his team was in order before getting lost in the moment of the win. Character and class, once again, was a priority. He is known as Coach Jim, J-Mill, Mill or Daddy as called by many of his athletes over the years (“He's become almost a father figure; ‘the White father’.” –Sarah Ha- SFS Class of 2016). 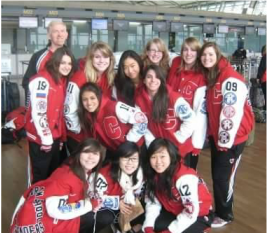 He has seen a great deal of victories and heartbreaks in APAC and also in their local KAIAC (Korean American Interscholastic Activities Conference) league while helping athletes through the years achieve multiple goals , creating lifelong lessons and memories. Jim has been on staff at SFS for 25 plus years. His name and lineage can be considered royalty as part of a legacy family at this historic school. Jim grew up in Norfolk, Nebraska and would eventually attend Nebraska Christian College where his father was the college president. While there he would play basketball and study Youth Ministry. His love for Christ and people (youth specifically) would drive him to eventually working at an Omaha area church where he led a Bible group for “singles.” I guess leading a “singles” group is a great way to meet other singles in the area because while teaching the class, Jim met former Seoul Foreign School Alumni, June Byrd. June was a young local teacher in the area and as we like to say “the rest was history.” Literally, they got married and moved to Korea to work at SFS and Jim would get a teaching degree in history. Fast forward 25 years and Jim and June are now the proud parents of Mattie, Michal and Mercy. 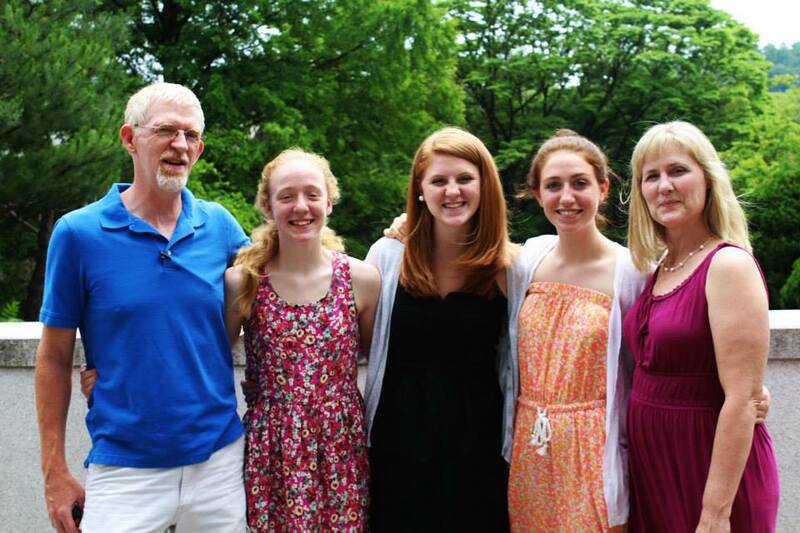 Their three daughters were all born in Korea and two have already graduated from SFS and attend college in the USA. Mercy is now a freshman in high school and finally gets to play basketball for her father on the varsity team. While working at SFS for those years, Jim had other coaching stints with Tennis and even Volleyball. International school coaches are all aware that they need to be prepared for just about anything. 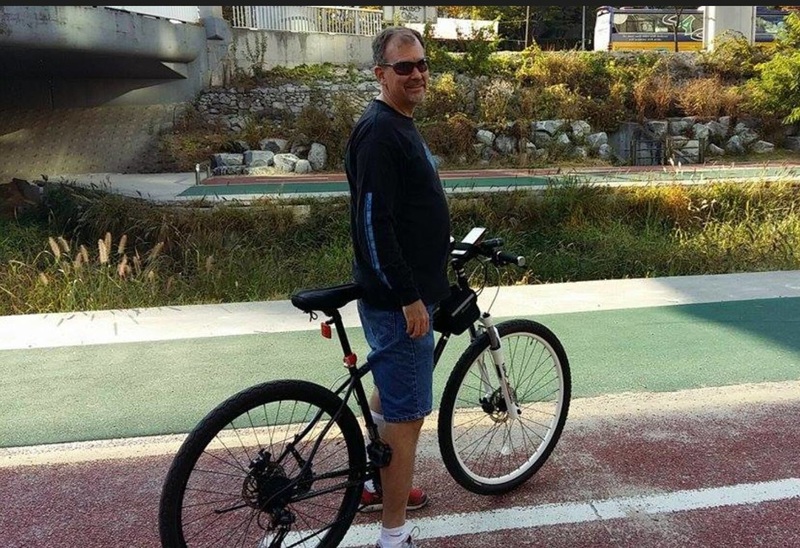 After years as a teacher, Jim would eventually ascend to the position of school Athletic Director and is now currently KAIAC president where his wisdom and experience as a Korea veteran would be respected nationwide with other AD’s and coaches. I have had the opportunity to know Jim for many years. I have always enjoyed his company, encouragement and passion for people and sports. I miss the Monday night duals on the basketball court when he would stop on a dime and pull up for a three point shot in my face. And then nicely saying with a pleasant smile; “good game.” For many people on the outside, perhaps Jim is a mystery. His quiet demeanor can often make you wonder “What is really going on in there?” I have watched and learned a lot from Jim just by watching him on the sideline with his arms crossed and interacting with his athletes (and occasionally the referees). When asked about some of their most notable memories of Coach Jim, many of his athletes through the generations all said the same thing “Left side! Left hand!” Clearly, fundamentals are important. Jim can also be known as a man of high character and faith. His long-time colleague, Jack Moon describes him this way; “He is one of the most genuine individuals I've ever met. He is a reflective, thoughtful person who leads from a quiet, inner strength.” Jack’s wife Edie goes even further by saying “Jim just might be Jesus in disguise.” Regardless if you believe he is an undercover Jesus or a lesser known incarnation of Phil Jackson, there is no doubt that he has left his print on the lives of his athletes in a positive way. As a young Nebraska man with aspirations to show young people the love of Christ and sports. Jim did just that while committing daily to the rigors and inconveniences of coaching in Korea. Nothing comes easy for coaches in Asia but he did it diligently. The international school world is a very transient one and finding anyone with longevity in the classroom or the sideline is the equivalent of discovering a rare gem buried in the heart of the earth. Jim and his wife June are just that. By being a father figure, he and his wife provided a stable family that many students perhaps never would have known or experienced otherwise. And many athletes and students are far better off because of it. CTI wants to acknowledge Jim and June for their hard work and commitment they have made to their family, athletes and faith. Thank you for the lives you have changed and know that you will be sorely missed by the community of SFS and all around Korea as you prepare to take a new step of faith in a new direction. I pray that God guides you and your family to bigger and greater things. Where ever you go, I know that your commitment to faith, fundamentals and family will be evident. I will never forget that infamous Saturday morning as I was crawling up the final mountain on our home Uijeongbu, Korea course with the salt from my sweat burning my eyes. My lung capacity seemed to be peaked as I was gasping for breath. For 3 miles, all I could ask myself was WHY AM I DOING THIS? Just when I thought death was imminent and I had nothing left to give, I heard an all too familiar voice screaming at the top of the hill “COME ON!!! YOU ARE ALMOST THERE!! !” Under normal circumstances, the tone of coach Olling’s voice yelling in my direction would result in annoyance or frustration. However, it is race day and I needed all the motivation I could get in order to finish. 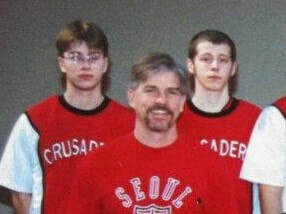 Coach Brian Olling started coaching cross country at International Christian School- Uijongbu in South Korea during the fall of 1989. In over 26 years of coaching overseas in Korea, Brian has seen hundreds of athletes run in his program (including myself). During those years he has been an important part of building the Korean American Interscholastic Activities Conference (www.kaiac.org). 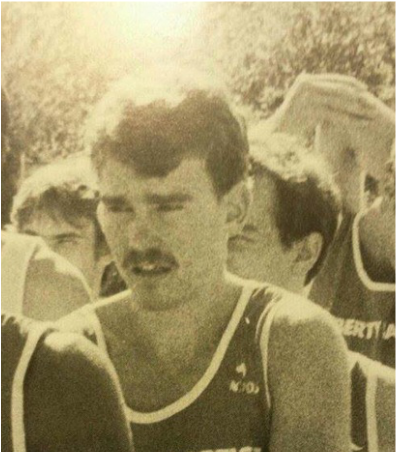 Brian has been competing as a runner for most of his life. He competed as a NCAA Division 1 athlete for Liberty University from 1982-87 where he found great success and gained national notoriety. There were even serious talks about the Olympics. However, Brian and his new wife Tami felt a different calling and decided to take a step of faith and take a job as a Social Studies teacher at ICS in Korea, while also taking up coaching duties for Cross Country and other sports and also adopting their daughter Moriah during that time. 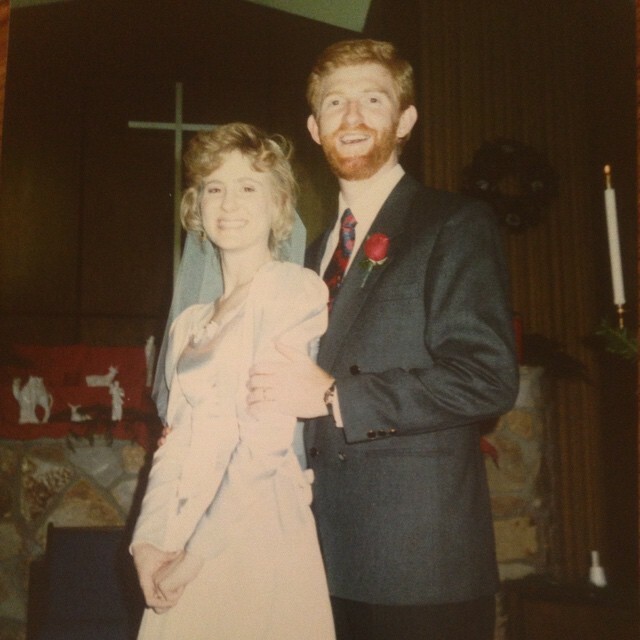 And over 26 years later, Brian and Tami are still there. And Brian is still putting together high quality teams that are not only competitive but possess high integrity. When asked why he enjoys coaching he responded by saying “I love to coach because I enjoy competition myself and love to see students compete and be successful as well. It is also a great chance to invest my life into others both in sports and spiritually.” Coach Olling also reminisces on some of his best runners such as Erica Rodriguez and Shawn Neuman, who would later run in university. Many athletes have competed under his watch and ICS has seen many All Conference runners over the years. It doesn’t take long in a conversation to get coach talking about his runners and past seasons. Former students will often testify with a chuckle about how easy it was in the classroom to get coach Olling to get distracted from his lessons by getting him to talk about running. Olling certainly has a passion for his sport and the students he has coached. Olling will tell you that he is a man committed to his family, faith in Christ and his work. I am blessed to know Brian Olling and his family personally and to have had him as a coach and teacher. Students are thankful for his passion and his longevity as a teacher at the school. Since international schools are very transient it is rare for students to come back to the school they attended and find teachers still there. However, the Ollings are still there for students to find and I pray that they continue. Meanwhile, Coaches Team International wishes to honor you and your family and thank you for the work that you do as a coach overseas and impacting students all over the world. High Five!! and NIKE salute for you! As father time is taking its undefeated record to Coach Olling, he is now coaching from his new wheels. At least runners don't have to worry about coaching olling beating them in a race anymore!.